The aim of our book is to show the incredible diversity of economic organization that has existed throughout human history. The life of an Australian aboriginal seems vastly different from that of a Wall Street commodities broker; a Japanese samurai would appear to have little in common with a seventeenth-century French courtier; and who knows what an English peasant would think of the activities of a modern Hollywood director. But for all the differences, what they have in common is the fact they all are products of their economic circumstances. And those economic circumstances are hugely determined by how economies are structured. What may come as a surprise to many is the fact that from the dawn of human history until today there really are only four ways for a society to organize its economic affairs: through cooperation, custom, command and competition (the four C's). Within these four “coordinating mechanisms” are to be found all the different economies that have existed. We start by looking at the “purest” forms of each and given examples from the past and from the contemporary age. Accordingly, we look at the life of the early foragers as well as modern Israeli kibbutzim; we examine the slave economies of Ancient Rome and also the totalitarian states of Fascist Italy and Nazi Germany; we see similarities between the feudal organizations of medieval Europe and Asia, and the Islamic Fundamental societies of the modern age. We also investigate the development of the modern market economies by looking at its origins in Mercantilist Europe and examine the opposition to it from socialist critics. Finally, in the last chapter we bring together all the various threads by examining and comparing eight contemporary economies---the former USSR, UK, USA, Iran, China, India, Sweden and Canada---each representing a somewhat unique blend of the Four Cs. 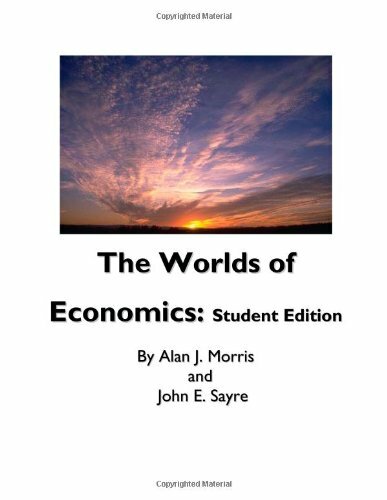 Alan Morris is an economist at Capilano University in North Vancouver, British Columbia. With John Sayre he is the author of the Principles of Microeconomics and Principles of Macroeconomics published by MCGrawHill Ryerson which have been adopted by over 30 universities and colleges across Canada and are now into their 7th edition. He is an avid devotee of classical music, birding, soccer and beer. John Sayre has taught at both Capilano Uniiversity and at Simon Fraser University in British Columbia and actually enjoys reading economics books and magazines as well as playing golf and listening to a wide range of music.